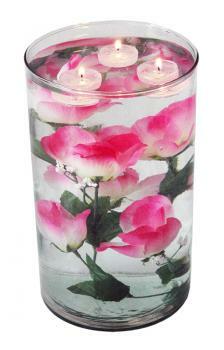 With their amazing clarity and translucent glow, gel candles can add romance and beauty to any centerpiece. Whether you're planning a special event like a wedding or simply want to decorate your dining room table with something a little different, making a gel candle centerpiece is fun and easy. For these ideas, you can use either purchased or homemade gel candles. This beautiful centerpiece is all about clarity. It's inexpensive and easy to make and can be assembled on a large scale for a major event. You can choose rose petals in any color to match your decor. Place the centerpiece bowl in your desired location. It's easier to create the centerpiece right on the table than it is to move a full bowl of water. Fill the centerpiece bowl most of the way with water, stopping about an inch from the upper rim. 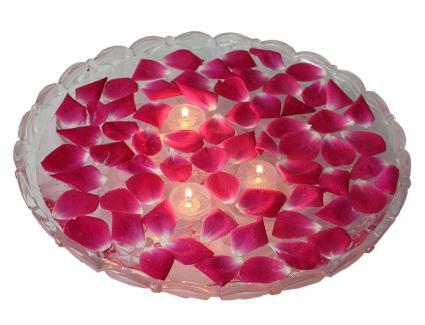 Sprinkle rose petals liberally over the surface of the water. Add the three floating gel candles, spacing them evenly throughout the dish. This centerpiece plays up the idea of transparency. The gel candles rests on water gels, creating a magical effect. If you're creating this centerpiece for a wedding, use flowers to match the bouquets. Otherwise, choose any flowers that coordinate with your decor. Soak the water gel packets or beads in distilled water according to the manufacturer's instructions. In many cases, this will be overnight. Place the centerpiece where you'll be displaying it. Add a few of the water gels to the bottom of the vase, filling it about one quarter of the way to the top. Add the flowers of branches, arranging them in a swirling pattern. Pour the remaining water gels into the vase to fill it to within one inch of the top. Carefully nestle the gel tealights into the surface of the water gels. This pretty centerpiece makes a great choice for a beach party or summer event. 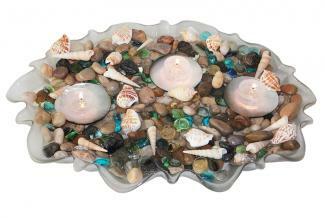 Gel candles float in upturned seashells, which are nestled amid beach stones and sea glass. Begin by placing the tray where you'll be displaying it. Spread beach stones and sea glass evenly over the bottom of the tray, creating a base for the shells. Carefully nestle the shells in the rocks, making sure they are stable and that the open side is facing up. Pour a small amount of water into each shell until the shell is nearly full. Add a floating gel candle to each shell. Scatter other embellishments across the tray. Another great way to create a beautiful centerpiece is simply to make a large gel candle and embed the items of your choice. Making gel candles is fun and easy, and this process gives you ultimate creative control over the appearance of your centerpiece. No matter which gel candle centerpiece you choose to make, you'll love the way these clear candles blend in with their surroundings. They offer a beautiful, understated way to add a candle flame to any centerpiece design.